The Regenepure Kit consists of the Regenepure DR Hair and Scalp Treatment Shampoo and the Regenepure NT anti hair thinning and Nourishing Treatment Shampoo. When used in tandem vitality is maximized. Regenepure DR & NT hair care kit is suitable for both men and women. *Individual results may vary. These products are not intended to diagnose, treat, cure, or prevent any disease. 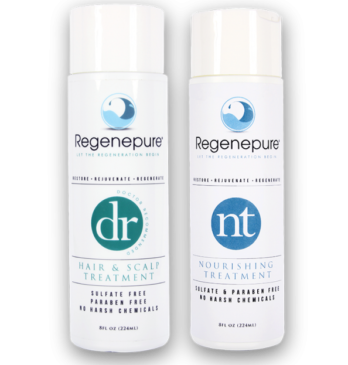 Take advantage of the potent and effective combination of the Regenepure NT Nourishing Treatment Shampoo and the Regenepure DR Hair Fall Shampoo. The NT shampoo will nourish condition, strengthen, and thicken hair, while the DR variant will help revitalize hair, while also cleansing the scalp. Moreover, both shampoos are free of malevolent chemicals, as well as paraben and sulfates. What’s more, the shampoos contain many premium quality ingredients that have been shown to help with hair thinning, fall, as well as promote hair thickness and fullness.